There are some days when you're happy to spend 10 minutes staring at your wardrobe and others when you want an outfit that's ready to go in less than three minutes. Mainly so you can snooze for a little bit longer. So you're ready to make the most out of your next lazy day, we have found six easy, throw-on outfits that are perfect for a day of brunching, lounging or mooching. Keep scrolling to see six lazy outfit ideas that won't look anything but pulled-together. 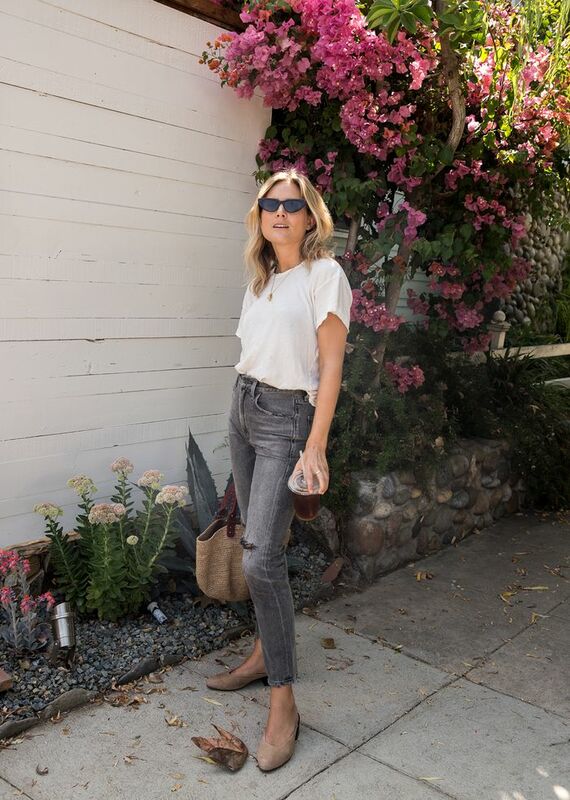 Style Notes: This is the ultimate lazy-day outfit—skinny jeans, a white T-shirt, a basket bag, flat pumps and most importantly, sunglasses for you to hide behind. An outfit that requires no ironing and no "does this go?" questions, so you can be out of the door in minutes. Style Notes: This is a slightly smarter twist on the jeans and tee idea—pair your straight-leg jeans with a tie-front shirt and backless leather mules. Style Notes: This will feel like you're wearing your pyjamas but actually look smart. Freddie Harrel's Me+Em tracksuit palazzo trousers with stripes down each side look smart when paired with her pumps and matching red knit. Style Notes: In summer, our ultimate throw-on outfit is a sundress and sandals—and Monica Ainley shows that a belted midi and leather slides are effortless but looks put-together. If you don't want to get dressed, then this is the outfit for you—pair a silk shirt like Lindsey Holland's one from Yolke with jeans and you'll be good to go.